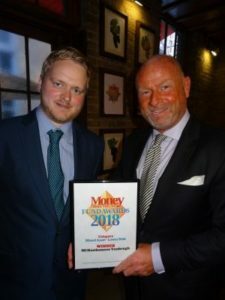 We’re delighted that the Vanbrugh Fund has won a Money Observer Fund Award – in the ‘Mixed Asset – Best Lower Risk Fund’ category. Candidates for the shortlist must pass a two-stage quantitative filtering process carried out by Morningstar which ranks each fund against others in the same investment sector, with risk-adjusted returns analysed over 3 years. Money Observer notes that investors in index-trackers are “hostages to fortune” whereas “a good active investment manager should be mindful of capital preservation in the bad times and produce above-average performance when markets are favourable.” Therefore in assessing winners for its fund awards, Money Observer looks for actively-managed investment funds that have achieved consistently good and lower-risk returns over 3 years. The July magazine also carries a double-page Q&A with CIO Fund Management & Senior Fund Manager Daniel Lockyer, who describes the aims and the focus of Hawksmoor’s Fund Manager team, and explains its multi-asset approach.